1. Why do we need cyclecamp? Cyclecamp is the only website that lists those campsites that are right for cycle campers and knits them all together into a workable network so that you can cycle from one campsite to another. There are other camping websites but they either have all the campsites in the UK or very few. 2. Why don’t you have campsites next to pubs – I like a drink! Some campsites next to pubs are excellent but they are very few and far between. Although it’s nice to be able to get a drink and a meal at a pub, cyclecamp prefers that the pub is a little way down the road – they can be noisy places at 11.00 pm at night just as you are trying to drop off to sleep. Many pub campsites don’t have showers. However, if they are very good we do list them. 3. I know a big campsite with lots of facilities - why isn’t it on the cyclecamp network? Big campsites with swimming pools, play areas, bars and lots of caravans tend to be a bit overwhelming when you’ve just spent the day on a bicycle. Many are also less flexible in terms of booking one night and can be expensive. 4. I have noticed a cyclecamp campsite without a shower: a very small number of cyclecamp campsites do not have a shower. This is because the campsite is excellent in other ways or because the owner is intending to install a shower. All cyclecamp campsites have toilet facilities without exception. 5. Why do you have advertising on the website? The cyclecamp website is paid for out of the advertising you see on it. Having advertising means that we can cover the cost of the site without having to charge a membership fee. 6. Does cyclecamp own the campsites? No. 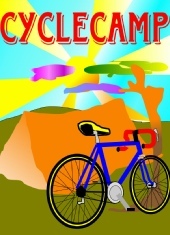 All the campsites in the cyclecamp network are already well established and have no connection to cyclecamp. However we do hope to encourage them to install facilities useful to cycle campers. 7. I know a small campsite that is just a beautiful field and nothing else! Why isn’t it on the network? As a cyclist you cannot carry a camp toilet, which someone arriving by car or caravan can. This means that the campsite must have a toilet facility and preferably a shower as well. 8. How do you do your research? We use all the information available to us but many of the campsites have been visited or stayed at by cyclecamp. However we are also very keen to get feedback from users and this also influences which campsites are on the network. 9. Who runs cyclecamp? 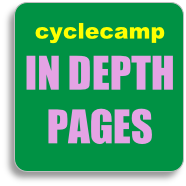 Cyclecamp is run a small publishing company who are also keen cycle campers – there are more details here. 10. Can we suggest campsites for the network? Yes, we are always looking for new suggestions and feedback about sites already on the network. You can make your suggestions on the forum or contact us here. Not all suggestions however will be accepted - they must meet the cyclecamp criteria. 11. Do the campsites pay for inclusion in the network? We will be introducing an affiliation fee for campsites but the unique quality of cyclecamp will remain - we select the sites to ensure that they are right for cycle campers. 12. I’m going to a specific town and there isn’t a cyclecamp campsite there: there should always be a cyclecamp campsite within reach (about 10 miles) but if you have very specific requirements you may need to stay at a non-cyclecamp campsite or even use other accommodation. 13. Why don’t I just wild camp? You are welcome to and it is often a good alternative to staying on a campsite - many cycle campers do, especially when they are touring abroad. But most cycle campers want what only a campsite can offer: security, a peaceful night’s sleep, a toilet, a hot shower and other cycle campers to chat to! 14. Why don’t you have reviews on cyclecamp? we’ve tried to keep everything as simple as possible. And in fact the sites are already carefully reviewed and researched by us here at cyclecamp. 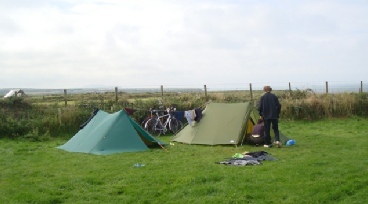 But if you do have a particular experience at a cyclecamp campsite (good or bad) let is know. There’s a link on every campsite page or you could also put a comment on the forum. There are lots of questions people have asked about cyclecamp! We try to answer as many as we can here but if there is anything else you want to ask why not get in touch with us here and we’ll see if we have an answer. For general questions about cycle camping please go to the forum and test the knowledge of our regular forum posters!